Screenplay Writers: Nicolas Wright, James A. Woods, Dean Devlin, Roland Emmerich, and James Vanderbilt. My science fiction fan husband and I went to see Independence Day: Resurgence June 24th. He even took a day of vacation from work so we could see it at 10:30 a.m. and get lunch afterwards. Was it worth his using a day of vacation? I will say it is a popcorn movie, one you go to watch without thinking. Still, there were flaws with this film. Remember the first movie? I watched it again as it was on HBO the night before and it is one of those films I can see over and over; comfort food. Bill Pullman gives a speech that makes you want to run out and join up, fight the aliens. Randy Quaid had been abducted by the aliens and is ready for payback and when he gets that chance—giving up his own life in the bargain—I still cry at that. Jeff Goldblum’s wanting to save the earth from our pollution, Will Smith and his wait until the fat lady sings, even Brent Spiner’s crazy all things alien geekiness, well, they made the first movie a good one. Plus, it a remake of War of the Worlds, where instead of the common cold kills them, it will be a computer virus to their systems. This sequel (and the end of the movie lets us know there will be a third one) has much better special effects. After all, it has been twenty years since the first movie. But the story, not so much. First film was the second biggest box opener back in 1996. This one, not so much, It opened with just $41 million in America and $102m in 57 overseas markets. They have taken the alien technology and merged it with our own. Sadly, Independence Day: Resurgence was indeed a perfect storm of “No.” A flurry of bad omens or poor decisions all came together to doom the picture. It could have survived a weakness here and there had it had other strengths, but it could not survive a convergence of negative variables. No Will Smith. We needed a hero, and his character was one. This sequel needed him more than he needed it. He was a breakout star of Independence Day. Had everything else clicked, losing Smith would have been a survivable wound. Their explanation what happen to Hiller? He had died in a freak accident caused by Liam Hemsworth’s character, Jake Morrison, on test flight. This bothered me. The man who was the lone survivor of his flight group in the first film, dies like this? Maybe a movie star like Dwayne Johnson or Harrison Ford might have saved it (heck, Ford can actually fly a plane or helicopter! ), instead the closest is Liam Hemsworth. Not Chris Hemsworth, but his younger brother. Last action film he did was The Hunger Games trilogy. And even in those, not the breakout star. We do get Jeff Goldblum back, along with Bill Pullman, Brent Spiner, Judd Hirsch, Robert Logia, and Vivica Fox. Fox has a short cameo. The rest get longer scenes, especially Goldblum. This makes the movie more of a reunion then anything. The next generation consisting of Hemsworth as Jake Morrison, Jessie T. Usher as Dylan Hiller, and Maika Monroe as Patricia Whitmore, did not do it for me. Women were given the shaft. None were allowed to be strong, even the next breakout hero. They could have written in Patricia Monroe as a strong character. Instead, big action play climaxes in her being rescued by the men in her life. There was one speech given later in the film that at least stirred me, though not on the level of President Whitmore’s from the first film. The aliens are bigger and so are the ships. But when the ship crashes and covers most of the Atlantic from England to the East Coast, then it comes to the new capitol in Washington D.C. and all it does is knock off the flag. It had the chance to be something more, to give us something more. 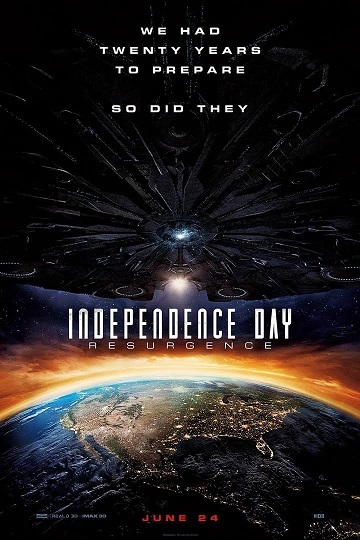 But Independence Day: Resurgence fell short of being nothing more than a popcorn movie, where if you don’t want to think, then this is for you. Just don’t expect the next step from the 1996 movie—you’ll be disappointed. Otherwise, wait for the DVD/ Blu Ray, or more so, Redbox or Netflix. And just rent Independence Day and both War if the Worlds from 1953 and 2005. I give Independence Day: Resurgence 3 ½ sheep. Oh no! I'm not happy to hear this. Like you I loved the first one. When I heard that this was coming out I was so excited. Then I found out that Will Smith wouldn't be in it. Not good. After that I found out that Mea Whitman wasn't reprising her role as Patricia Whitmore even though she's still acting. It's stupid but it has really been bugging me. I thought there was one in between the first one and this one. Oh, well. Sounds like I can wait for it to come out for the small screen.